Internet of Things (IoT) is one of the biggest technology everyone is talking about. IoT is beginning to grow significantly, as businesses, consumers and governments recognize the benefit of connecting inert devices to the internet. CDN Software Solutions an innovative IT solutions and service provider company is exhibiting in CeBIT Australia 2016. At CeBIT, we will explore the possibilities of IoT for business. Yes we will give innovative and smart ideas that how you can apply the magic of IoT in business to get better results. Internet of Things technology is very big in itself. It will create amazing results in growing or speeding-up your business. Not only this, it will also save billions of dollars. So now you will think, how it is possible that a technology which is boosting-up your business sale and save your money as well? So for its answer, you have to meet us in CeBIT Australia 2016 at booth no. J20. If you are not attending this event, don’t worry, we have free passes for you. Contact us here to attend CeBIT australia 2016. How IoT will Change Your Business? * It will allow your organization to make smart products or to provide smart services. The touch of IoT will make your products or services smartest, more useful or more connected. * The Internet of Things will enable smarter business operations and smarter decisions. The sensors never lie. Yes with the help of smart sensors, your business will collect more and more specific feedback on how products or services are used, and what user might want in future. * It will signal you the possibilities of a change in business model or methods. IoT to Drive Everything, But What will Drive IoT? Now you will think that IoT is driving everything, smart car, smart home, smart apps and connecting each and every thing to each other. So in the coming years, IoT will drive everything, but what will drive IoT? Don’t get confused, the smart software and sensors be-hiding in IoT drive. CDN Software Solutions will help you to drive your business faster than ever. So, if you have any idea to make an IoT solution for your business, here we are for you. 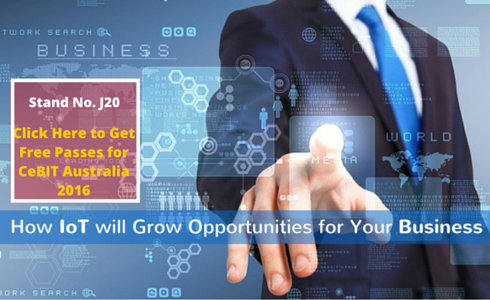 Just contact us here to share your idea or to meet us in CeBIT Australia 2016. CDN is also providing free passes to its visitors in CeBIT Australia, You may contact us to avail your complimentary pass.